Two catheters or guidewires can be combined on one card, saving material and space. An award-winning solution for packaging catheters in flexible formats has just been adapted to hold two catheters and/or guidewires. 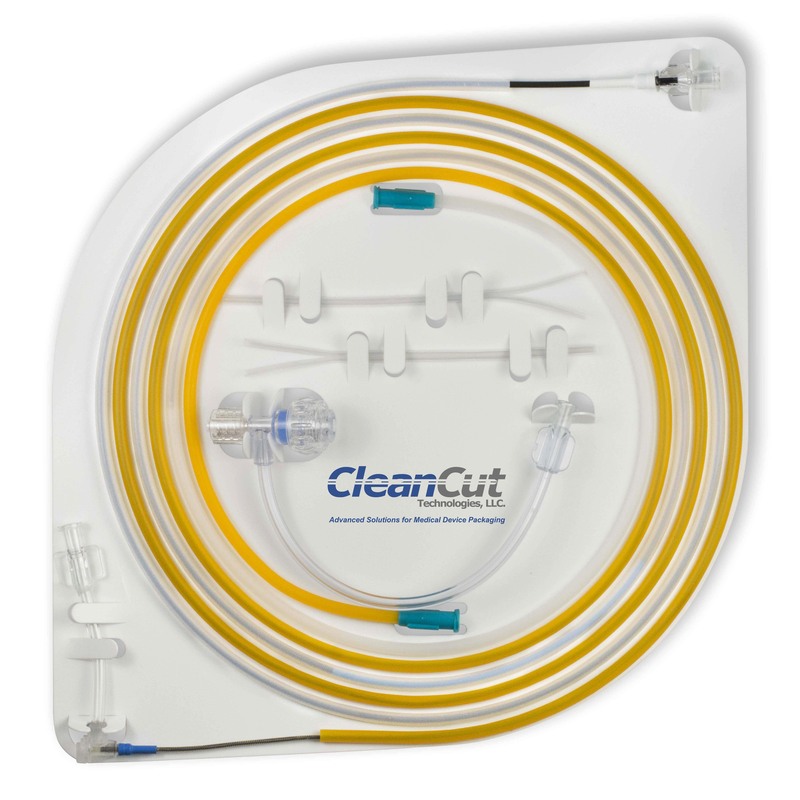 The Dual Hoop Catheter DISK (Dispenser Integrated System Kit) by CleanCut Technologies features a clipless catheter and guidewire dispenser bonded to a HDPE backer card. Adapted from the company's original DISK design, which won a Medical Device Excellence Award in 2014, the new system adds a second clipless dispenser to the backer card to retain multiple catheters or guidewires. The dual-hoop system is designed so that two catheters or guidewires are integrated together on the card, saving material and space. "The Dual Hoop DISK is beneficial to medical device manufacturers because of the elimination of additional packaging, individual component packaging, and additional cartons and shippers," Brian Whalen, CleanCut's director of sales and marketing, told Qmed. "This combined system will reduce sterile barrier component count, packaging material, inventory space, and logistics transactions, resulting in overall improved inventory management." These reductions can lead to cost savings, which medical device manufacturers are seeking, he added. "Medical device manufacturers are requesting cost reduction while maintaining or improving patient safety, user experience, and sustainability. Packaging innovation is one area where those goals can be realized," he said. Whalen says the system is also easy to use, both during assembly and end-use. "Medical device manufacturers are also impressed with the easy assembly of the Dual Hoop Catheter DISK, the reduced footprint, the quality of the DISK, and the benefits the end-user experiences. The end-users, nurses and medical professionals, have stated that it is easy to handle and use, saves time in the operating room, and is safe and effective packaging." To help users identify which device component they are accessing, "print can be added to the backer card to easily identify components or offer instructions for use, company or product logos, etc.," he said. The Dual Hoop Catheter DISK currently only accommodates two catheter or guidewires, but the system could be customized. "We have not received any requests to add more than two; however, the DISK can certainly be designed to hold more than two," he said. "All of our designs are customized to meet the needs and requests of our medical device manufacturer customers." Whalen reports that the Dual Hoop Catheter DISK was reviewed during HealthPack's annual "Voice of the Customer - Nurses & Technicians" panel held March 8, 2017, in Denver. "The panel of four nurses reviewed it," he said. "They liked the fact that it did not roll off the sterile field and that it had the capability to hold multiple catheters and surgical components all in one system. They also expressed that it is easy to hold and remove or reload the components as needed." For more details on this panel, see our sister publication's article, "Easy-to-open packages preferred by nurses and medical technicians." The Dual Hoop Catheter DISK meets the Packaging and Packaging Waste Directive (94/62/EC and 2004/12/EC) for limiting packaging weight and volume, while meeting green initiatives for the utilization of recyclable packaging materials, the company reported. CleanCut Technologies is an ISO 13485 certified medical device packaging company and manufactures its products in ISO Class 7 (10,000) & ISO Class 8 (100,000) certified environments with full traceability. Free samples of the Dual Hoop Catheter DISK may obtained by contacting CleanCut Technologies at [email protected] or calling 714-864-3500. For more details, visit www.cleancuttek.com.